The Cedar Mesa trail is located in the Grand Mesa National Forest near Grand Junction, Colorado. The west end of the trail begins at Cedar Mesa Reservoir where it travels past multiple other reservoirs and lakes as it climbs over a pass between two peaks and descends to its eastern trailhead on the Leon Lake Road in Marcot Park. The first mile of the trail gets used a lot by fishermen to get to Trio Reservoir while most other use is from hunters and OHV enthusiasts. 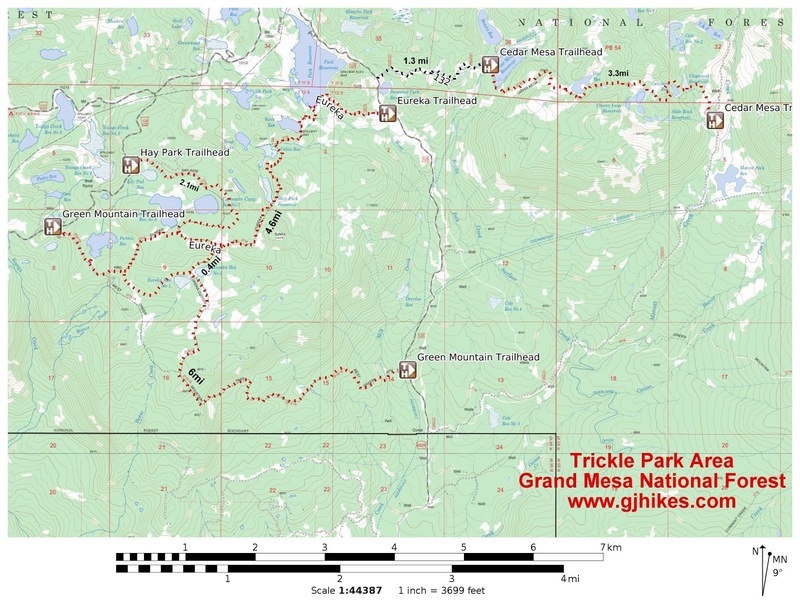 To get to the trailhead follow Forest Road 121 from the Grand Mesa Visitor Center near Cobbett Lake for 7.6 miles and turn right onto the Surface Creek Road FR #125. Follow FR #125 for 1.3 miles as it travels around the east side of Trickle Park Reservoir. At that point the Cedar Mesa Road, FR #132, branches off on the left. This is as far as 2-wheel drive passenger vehicles can easily go. It is 1.3 miles down the Cedar Mesa Road to the trailhead. The road can be impassible when wet even for 4-wheel drive vehicles. During optimum conditions any high clearance vehicle could probably safely drive the road but a 4-wheel drive is recommended. The trail starts out crossing the Cedar Mesa Dam after which it works its way around to a trail squeeze that limits OHVS to 50 inches or less. From there the trail climbs some steep grassy slopes where it quickly gains about 150 feet of elevation taking it above the 10,000 foot level. Near the 1 mile point the trail passes around the south side of Trio Reservoir where it follows a route through a talus stretch of basalt. From there the trail winds its way through the forest as it continues to gradually gain in elevation until it tops out at 10,328 feet before beginning its descent. The elevation profile of the trail shows the nature of the climbing involved. The round trip elevation gain comes out to 1,124 feet. 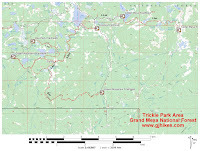 Some of the lakes along the trail include Cherry Lane, Calumet, Slick Rock and Chipmunk. Each of them provide a peaceful mountain setting for passers by to enjoy. From its high point the trail begins descending gradually until it gets to the last half mile where it makes a steep drop into the scenic Marcot Park and quickly loses over 250 feet of elevation. At the 3.3 mile point the Cedar Mesa trail meets up with the Leon Lake Road just north of Marcot Reservoir and comes to an end. We saw several deer along the way like this buck that seemed more than happy to pose for a photo. On the return trip it was laying in the tall grass trying to take a nap. We also caught site of a bull moose on the drive over the mesa. We only drove about halfway in on the Cedar Mesa Road before deciding to park and begin hiking. It had rained the night before and there was an F250 at the bottom of one of the hills that was stranded in the mud where the driver had left it and walked out. Since more rain was expected we weren't going to take the chance of having the same thing happen to us. The Cedar Mesa Road is very pleasant to hike anyway. As far as the Cedar Mesa trail goes it is an excellent hike and looks like it wouldn't be too bad for mountain biking either if you don't mind a good workout. If you would like to see it for yourself then all you have to do is 'Take a hike'.